Panoramic FIVE (5) ACRE VIEW lot with BUILDING PAD! "The Ranches of Sky Mesa" gated HOA secure and gated community. Located in Southwestern Riverside County between Nuevo and Menifee Valley. 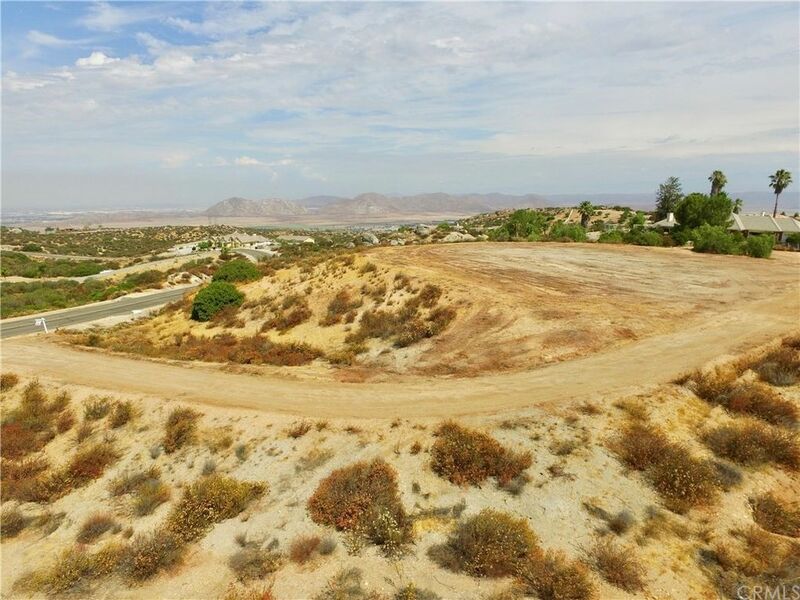 This Sky Mesa view parcel has a driveway leading to a large pad. Four horses allowed. No mobile homes permitted. Minimum 2,800 sq ft homes with 3 car garages. Utilities in street. Propane and septic area. Newly paved roads and signage. This is the only secure gated community for miles. Entrances on Nuevo Rd and also on Sky Mesa off Juniper Flats Rd. Restaurants, fast-foods, shopping, gas stations, medical/dental offices and additional services. Extensive commercial development located at the corner of Newport Rd and the I-215 freeway, minutes away! New development planned, including schools, parks and shopping in Nuevo/Lakeview Valley, just outside the back gates of Sky Mesa. High-tech security cameras located at both entrances. Guests can be buzzed in from the gates. All the new industrial, commercial and also residential subdivisions outside the gates make this a ground floor investment and convenient location for a custom, or second home retreat. Recreational lakes include, Diamond Lake, Lake Elsinore and Perris Lake all within a short driving distance. Easy access to Highway 74 (Florida Ave) Ramona Expressway, the new realigned Highway 79 and I-215 leading to San Diego or Riverside, San Bernardino, Orange and Los Angeles Counties. Directions: I215 E on Florida (Hwy 74) to Juniper Flats Rd to L. on Sky Mesa to gate-scroll to Smithson & he can buzz you in! Improvements: Improvements: Utilities in the newly paved street, graded driveway and pad, gated-secure HOA community.